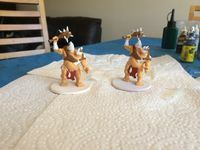 I have been into the board gaming hobby for almost two years, and I recently started having a go at painting miniatures. 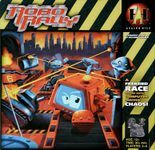 My first attempt at painting is RoboRally, and my ultimate goal is to build up to being able to paint something like Descent: Journeys in the Dark (Second Edition) (and be able to do it reasonably well). For anyone who is interested in trying this for themselves, I will include details of the resources I used as I go. Before I started to ruin my miniatures with my beginner painting skills, I decided to do a bit of research into how to start this out properly. But where do you start? Particularly follow the instructions around the materials you will need and you will at least have everything you need to start with. A size 0 brush is not small enough for the detail - I found a size 000 brush at the local paint store (which was also quite cheap) and this does the job quite nicely on the detail. Paint consistency is one of the most important things to get right. If you don't water it down enough you will see brush marks and lose details, but if it is too watery then you don't get proper coverage. This is something I'm still learning to get right. Shading and colour transition is HARD, and will take a lot of practice to get right. I need a lot more practice before I can do this well. Learning takes a lot of time, and this first effort took a couple of hours PER MINI. I expect I will get faster as I improve. I however found it quite relaxing working on these and it is a great extension to the board gaming hobby. Glazing (this is a very interesting technique and I have found it useful). While I am not anywhere close to being good at blending, I tried a Vallejo medium transparent product to help mix and also thin out the paint (instead of water) and it did create a smoother finish. The results of my first effort (some photos below). The first robot being painted (Zoom bot). Still much to learn, however I'm happy with this first effort (my favourite is hammer bot, which was one of the last to paint where I was able to put into practice a lot of what I learned on the others). Started working on painting Talisman. 18 miniatures total. First one completed (the Troll) - trying out a couple of different techniques (glazing and the use of pre-prepared grass tufts). Was good experience, and now confident enough to do more than one at once. Eyes first, then initial base coat done, using 'mossy green'. Toads in progress as colour built up using progressively darker greens, then moving to brown. Toads following completion of highlighting and shading, just prior to finishing touches on the bases. and.. toads completed (3.5 hours to paint all four, including setup, packup, and sealing). The Evil Wizard (very happy with how this one turned out). 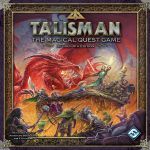 The Talisman ladies (the Prophetess and the Sorceress). Tried out flocking to create a textured base and grass. Happy with the results. The Monk and the Dwarf. Getting faster now - my new silver and gold paints came in very handy for the dwarf. Started the long process of painting the miniatures from Descent: Journeys in the Dark (Second Edition). Started on the shadow dragons on a lazy Sunday afternoon. Base coats completed as well as initial highlights and some dry brushing. Just need to finish the detail and work on the bases. Shadow dragons finished (master and minion painted in different coloured bases). Next up - Ettins. Initial base coats done prior to starting on the detail, highlighting and shading.